It’s the early 14th century in Europe. Trade and travel overseas and across continents is thriving, and out of Egypt emerges playing cards painted with tarot-like suits. They feature staves and swords, cups and coins… all of which can still be found on traditional Italian, Spanish and Portuguese decks. Playing cards certainly have a rich and long history, tracing all the way back to 1377. 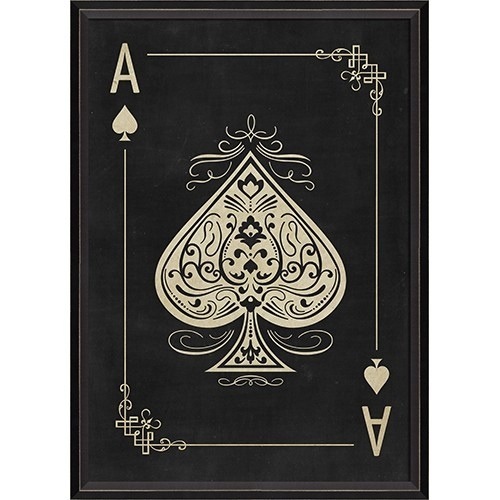 Display your love for this timeless game with our new Playing Card Framed Prints! Exquisitely detailed, these white-on-black prints were made for that empty wall space in your card and game room, by the bar or in any entertainment center!